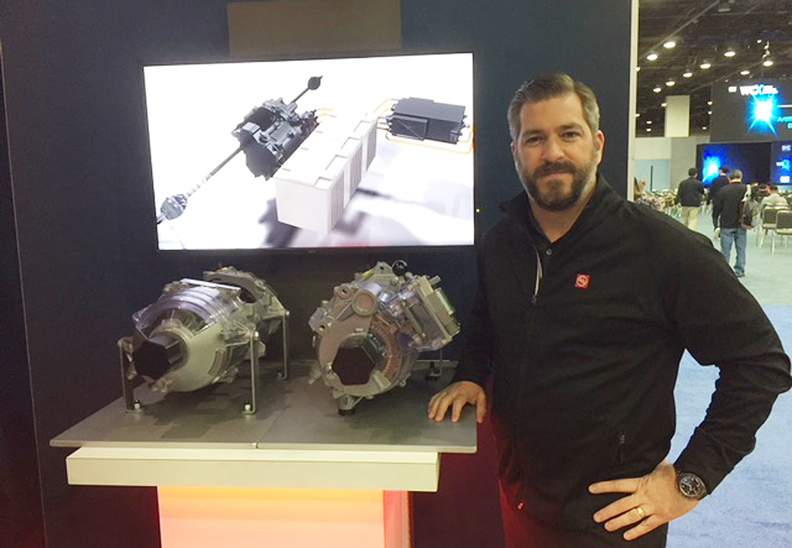 American Axle's Anthony Pistagnesi with the electric drive unit from the Jaguar I-Pace. The company's eAAM division -- comprised of former Saab engineers -- developed the Jaguar's front and rear electric drive units. DETROIT -- Jaguar's battery-electric I-Pace crossover has become a statement of the brand's design and engineering prowess since it launched last year. And Jaguar can partly thank its defunct old competitor Saab for that. The I-Pace's electric axles were engineered by former Saab employees in Trollhattan, Sweden. It's a twist of auto industry ancestry, acknowledges Anthony Pistagnesi, executive director of product engineering for Detroit's American Axle & Manufacturing Holdings, a key supplier to Jaguar Land Rover. Swedish automaker Saab folded not long after General Motors sold it in 2010 to Dutch sports car maker Spyker. But part of Saab's engineering corps not only lived on but still prospers. When Saab was struggling to survive in 2010, it formed a joint venture with American Axle to develop electric powertrains. Saab slipped into receivership when it failed to line up new investors, starting a long liquidation process. And in 2012, American Axle bought the part of the joint venture it didn't already own and renamed the division eAAM. The 70 or so Saab engineers moved to a new center in Trollhattan and continued developing electric powertrains, Pistagnesi told Automotive News this week at the SAE International WCX World Congress Experience here. "EAAM's heritage was the Saab all-wheel-drive engineering team," Pistagnesi said. "They were really pushing towards electric all-wheel drive, in advance of the rest of the market. They had come to the conclusion in the mid-2000s that the car was going this way and they were putting the skill sets and designs into place." Pistagnesi, a 15-year company veteran, said American Axle had a strong relationship with JLR when I-Pace development started. American Axle supplied the transfer case for Land Rover's rugged Defender SUV, as well as the front drive axle for the XE awd sedan. "We have a great relationship with the JLR team and we love working with them," Pistagnesi said. "I got a call in 2014 from the JLR team. We'd been showing them our technology and they were interested in knowing what we could do in terms of a drive unit for a battery-electric vehicle. "So we brought our eAAM team over from Trollhattan and had a number of meetings," Pistagnesi said. "We really convinced them we had the right capability and right design and technology." Jaguar engineers came up with the basic design specs of the I-Pace's proprietary electric motors and, working with the eAAM team, they created the two compact drive units that power the front and rear wheels. Next year, another European automaker will launch a vehicle with an electric drive unit developed by eAAM's former Saab engineers. Most of American Axle's revenue is derived from selling live rear axles to manufacturers of rear-wheel-drive pickups and SUVs, as well as four-wheel-drive and awd vehicles. But the company is pushing further into electrification. "American Axle has invested in the capability to design electric motors," he said. "We believe that is critical to our value proposition, and critical to our ability to arbitrate the trade-offs in the design of a propulsion unit." Globally, Jaguar has delivered around 8,000 I-Paces since the vehicle launched last summer. It also has won more awards than any Jaguar model in recent history.